The skyscraper aims to generate a solution for the unprecedented air pollution in Tehran, Iran by combining several innovative technologies in one. Tehran’s air pollution has been a decade-old issue, which has exponentially increased, in recent years. On average, one person dies of air pollution causes at every two hours, and people have been chocking to death from the air they inhale. The most significant causes of pollution in Tehran are the overwhelming number of vehicles, loose inspection regulations, high immigration from villages into the capital, non-standard gasoline, and most importantly the topography of Tehran. The deep topography is due to the mountains surrounding the city. This has resulted in the air being trapped. The site has been picked in the center of Tehran where the air pollution is the most concentrated and the topography is at its deepest. With this aim, the suggested skyscraper would create a new chain system between smartphones, pollution, and architecture. The most important factor is the involvement of people in the appearance of the skyscraper and the amount of data received from the people (through their smartphones) to fight pollution. This is done through an app, which syncs in real time with the skyscraper, creating a spatio-temporal system of visual and spatial syncing between pollution and architecture, through the people. The app provides different services for the exterior and the interior of the skyscraper on smartphones. The facade of the project is equipped with the quantum stealth material technology, which bends light to create invisibility, in accordance with the level of pollution. The data received form the various directions would be translated into the facade of the architecture. The amount of pollution directly affects the visibility of the architecture. The less pollution there is, the less visible the skyscraper would be since it is in a de-activated state. 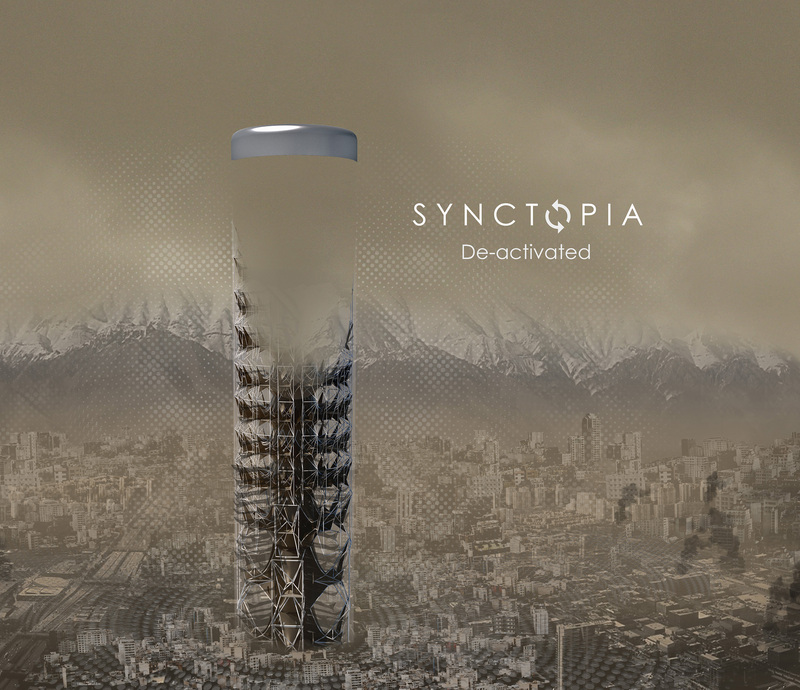 As the amount of pollution starts to rise, the architecture unhides and is activated in order to fight pollution through the diffusion of catalytic converters infused in a capsule. The panoramic composition of the architecture has equal access to flow of data from its surrounding. The information fed by smartphones is received by the data vacuums, which are arranged on the parameter of the skyscraper. These vacuums are architecturally composed to represent the flow of data from the exterior into the core of the architecture. Staring from only structure and void, the vacuums smoothly convert into mass to represent the materialization of data. The app provides spatial syncing through vertical elevators in the interior for experiential purposes. These elevators have been placed in the core, allowing access to the data vacuums throughout the skyscraper. The elevators only sync with the smartphones inside the skyscraper and allow access to the levels that are visible from the outside. The more visible the architecture, the more levels will be accessible in the interior through. The app would display the accessible levels at any given time and the elevators that could be used to get to those levels. The two platforms at the bottom and top of the project act as indicators, which are always visible and accessible to the people. The bottom platform indicates the entrance, and the top indicating the maximum height at 600m. As a result, the polluted air would be filtered with the support of the people, the advancement of technology, and architecture. The skyscraper would introduce a new chain reaction between the three where each factor depends on the other. With the introduction of the new visual and spatial experience, syncing becomes an architectural entity.